Just like any other room in a house, creating the perfect kitchen is all about making sure that the final details are in place to make it feel like home and full of style. A few final kitchen accessories that are both pretty and practical, and will help give your kitchen that individuality it may be missing, giving your kitchen that all important character. These beautifully shaped glass bottles from Nkuku are perfect for storing your olive oil or balsamic vinegar and they make a lovely companion for a rustic or country style kitchen. I came across these ceramic spice spoons and instantly fell in love, what sweet little designs! Hang them in a row above you cooker, so that they’re in a handy spot but also become an interesting but simple design feature. If you want to give your spices and herbs even more individuality, empty them from the store jars and into some fun like a vintage jar; there are loads of Etsy, both in sets and single items. I love this emerald green pot, which would like great on the counter, and could be even be used for other kinds of storage. To accompany your jars, a handy utensils pot won’t go amiss, this one from Garden Trading is made from raw marble and looks fantastic; a great option if you want a minimal look. Your utensil holder will be the perfect place to store these beautiful gold serving spoons, they’ll look good on the table and in the kitchen when not in use. I love this silky looking sugar bowl from Holly’s House, the pearl-like coating and cute gold button handle make it great for everyday use and pretty enough for those special occasions. It also has a matching pot and milk jug if you want to complete the look. Who could resist this little dotted pepper grinder from Anthropologie, the gold dots give it a playful nature against the cool marble. Tea towels are made for practical reasons, but sometimes you just need a very pretty one to look at, like this adorably designed Clarke dish towel from Anthropologie. Finally, for when you need to keep your cool whilst trying out a new recipe, or preparing a meal with all your family surrounding you, keep your cookbook firm in place with this gold wire stand from Rockett St George. From big decisions to small accessories, making your kitchen special is all about finding its personality and presenting it to the world and yourself; as well as making it a fun, stylish place to be in. Updating a kitchen is quite a sizeable task, perhaps one of the biggest you can do in a home. If you don’t have the time, patience, energy or funds to redo an entire kitchen, you can easily inject a bit of freshness into a kitchen’s look with the addition of a few new kitchenware accessories. Whether you want to change the style, or just give the room a little facelift you’ll be surprised how far a few pieces can go. While there are endless amounts of products and accessories out there, I’ve picked out just a few from all different styles you give a taste of the possibilities. If you’re a keen baker (or even if you’re not) you’ll love this hand-painted rolling pin from Anthropologie. The beautiful decorative style means it’ll look just as wonderful when it’s not in use as well as when it is. Staying in the bohemian style, these petite mugs from Oka are so charming! The hand decorated cups are just the right size for an after dinner beverage, plus they’ll look divine on display, their bold colours are really eye-catching, making them the perfect way to complete or start a collection of beautiful crockery. If you’re interested in re-doing your kitchen in a more contemporary style there are hundreds of ways to go about it. I’m not usually a fan of pink, but these Schiap plates from Oka are rather special. The clean candy-pink stripes and black rims give the classic style a glamorous twist. Another pretty in pink addition to the kitchen are these luxurious bowls from Heal’s. Their effect is created from hand applied metallic lustre. They’re a fantastic update to a contemporary table or kitchen, and are the perfect injection of colour to neutral palette, especially if you want to create a high-end, feminine look. Whether you’re getting good use of out if, or just mainly using it for decoration, a beautiful pestle and mortar is a must-have for any kitchen. This shallow, stone one from Holly’s House is a lovely contemporary piece that will show off whatever spices you crush up in there. A kitchen bursting with colour can really take your breath away, but you may not always want your surfaces and cupboards to reflect this. Instead, choose your accessories to channel your inner rainbow. I absolutely love this bubble glassware collection from Graham & Green. The hand-blown pieces purposely have tiny air bubbles to create a light and airy appearance. They will look gorgeous littered around a table, tucked up on a display cabinet or dotted around a kitchen to tie a theme together. Another special piece from Graham & Green is this antique plate holder. Perhaps you have some wedding plates you want to keep safe, or just want to jazz up your ordinary, everyday crockery you can display them in this stylish holder. If you enjoy a little mid-century style, take a look at this adorable storage jar from Heal’s. Taking its influence from the 1930s and 1940s, designer Cressida Bell created this little champ, perfect for keeping your biscuits in! Another retro piece of kitchenware that will make your home that extra bit special are these Art Deco style trivets. The geometric style is super swish and elegant and will work as decorative pieces when not in use. Last but not least, if you can’t get enough of some geometric shapes, these flamboyant tea towels with an eye-catching pattern should do the trick. Swap out your old, fading tea towels for some fun, vibrant new ones. We’ve all experienced the odd culinary disaster, particularly in the baking department (me more than most I suspect) and whilst presentation will never make things taste better, a minor collapse (a de-thawing for example) could be brought back from the brink of the dustbin by a gorgeous platter or cake stand. Should such an event occur in your household, I have some presentation suggestions for you. One of us in the office (who is still extremely young) had a birthday this week and our lovely Jenny who is a cake baker supremo made this little beauty and it was absolutely delicious. I have to admit that this picture is from Woman and Home, where you can also find the recipe – our cake was just as lovely but the office mugs are not quite as photogenic. This is one of my favourite cakes, it’s so moist and has just the right balance between the tangy lemon and sugar. Most lemon drizzle cakes use icing sugar for the syrup topping but I like to use caster sugar which forms a delicious crunchy texture as the cake cools. 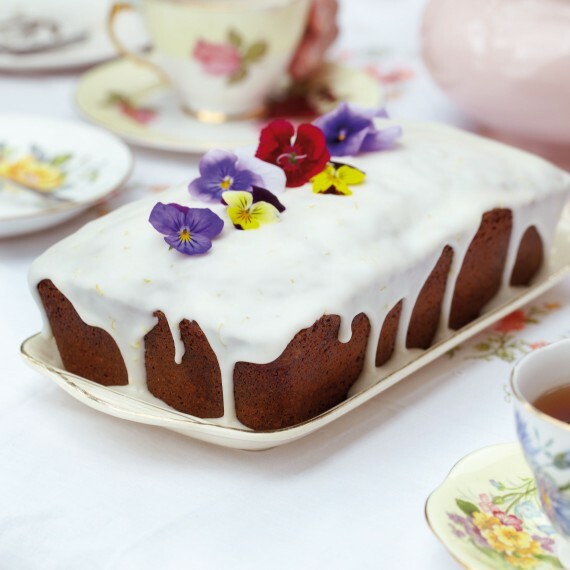 This is a really simple recipe, always a crowd pleaser and it’s perfect with a cup of tea! When I make this cake, I’ll usually weigh the four eggs first then use the same quantity of butter, sugar and flour but 200g shouldn’t be far off. That way you should get the perfect texture every time. All your ingredients should be at room temperature before you start, particularly the butter and eggs, to make sure your cake rises beautifully! Beat the butter, sugar and lemon zest in a mixer or using a handheld electric whisk until very pale and fluffy. Add the eggs one at a time, beating in between. Don’t worry if the mixture curdles slightly. Sift the flour and baking powder then add to the mixture bit by bit. Gently fold the mixture (don’t whisk!) using a plastic spatula or metal spoon until all the flour is incorporated and you have a smooth cake batter. Add a little milk to loosen the mixture slightly if it’s too thick. You don’t want it to be too runny so add a spoon at a time and see how it is. Pour into a cake tin and bake in the oven for 50 minutes – 1 hour. Test the cake to see when it’s done by inserting a skewer, if it comes out clean it’s done. While the cake it baking, mix together the lemon juice and sugar. When the cake is done, take it out of the oven but leave it in the tin. Poke holes all over the cake using a skewer or fork and pour the lemon juice and sugar on top then leave to cool in the tin. If you are mixing the batter by hand, place the flour in a large bowl and make a well in the middle. Crack the egg in the middle and mix the milk and water together in a jug. Beat the egg with a fork or whisk while adding the milk and water mixture a bit at a time and gradually bringing in the flour until you have a smooth batter. It should be quite thin and just coat the back of a spoon or ladle. Alternatively you can mix it all together with a handheld whisk or food processor. Then add the melted butter and a pinch of salt and let the batter rest for a little (about half an hour). Heat a frying pan over a medium-high heat. Melt a knob of butter and use some scrunched up kitchen paper to wipe a thin layer of butter onto the pan. Spoon some batter into the pan using a ladle, swirling the pan around at the same time to cover the bottom as thinly as possible. Use a spatula or palette knife to loosen the edges and flip the pancake over when it is golden brown underneath. Flip the pancake using a utensil, or flip the pan if you’re feeling brave! Cook on the other side for a few more seconds and turn out onto a plate. Place the pan back on the heat, coat with butter again and repeat! I love mine with lemon and sugar, such a classic! For me it has to be fresh lemon juice and granulated sugar (for the crunch!) but why not try maple syrup and bananas, berries and whipped cream or chopped nuts and chocolate sauce. Don’t have a sweet tooth? Savoury pancakes can be just as delicious! Try roasted vegetables and creme fraiche or smoked salmon and cream cheese. The possibilities are endless! However you have them, I wish you a fabulous Pancake Day!